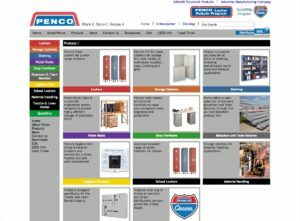 Penco Products, Inc. is America’s leading supplier of storage products and material handling solutions. With over 140 years of experience in the design and manufacturing of high quality storage solutions, Penco is known for innovation, quality and support. With a modern 475,000 sq. ft. plant in North Carolina, Penco’s product portfolio includes; Lockers, Shelving, Pallet Rack, Storage Cabinets, Shop Furniture and Hygiene. Penco’s QuickShip Distribution Centers ensure your products arrive on-time with reduced shipping costs.